DESCRIPTION -- Souvenir spoon from the American battleship the Olympia. The vessel was the flagship of Admiral Dewey and built in 1892 and famously fought at the Battle of Manilla in 1900. The item is 4" (11cm) and shows on it at one end a picture of the ship and on the other a picture of Admiral Dewey (click on the picture to see the engraving on the spoon). HISTORY -- The Olympia was Admiral George Dewey's US Asiatic Squadron flagship. On May 1, 1898 the Olympia led six other US warships into Manila Bay in the Philippines and engaged and defeated the Spanish Pacific Squadron. The battle was the first major engagement of the Spanish-American War. It was during the battle that Dewey gave his famous order, "Gridley, you may fire when ready." Dewey and the Olympia became immediate icons. The Olympia served again in World War I and was the ship that brought home the body of the "Unknown Soldier. It was the Olympia's final duty as a US warship. In 1922 the Olympia was decommissioned. DESCRIPTION -- Souvenir spoon from the vessel the Royal Daffodil which is is in an excellent condition and the size is 3" (9cm) long and shows the coloured houseflag at the end of the spoon (click on the picture to see a close up of the houseflag). DESCRIPTION -- Original whale tooth which has been hand carved by an old seaman into a holder for a pair of ivory spoons. It is a fantastic find and a one-off unlikely to be found again and dates from around the early 1900's and the condition of the item is excellent and the size is 4" x 2" (10.5cm x 6.5cm). DESCRIPTION -- From the old vessel the Sea Princess this is a sailor doll souvenir which is in a good condition and a rare find with the size of item in box being 9" (23cm). HISTORY -- The former vessel, the Kungsholm was to become the MV Sea Princess was a ship that would become one of the most popular cruise ships around, in spite of the shock of her new look, which was highly criticised by most ship lovers. The truth was that on board P&O ensured that she had retained much of her delightful charm, for as time would pass she would win the hearts of so many around the world over the years! The new Sea Princess could now accommodate 750 passengers in style and she was registered as being 27,670 GRT. Upon arrival in Southampton her first passengers boarded, many of whom were bound for Singapore and Australia. 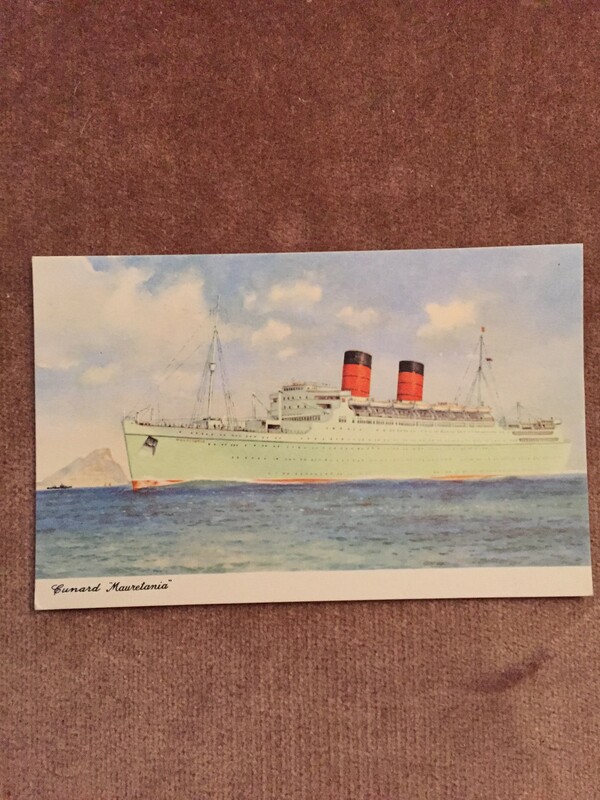 DESCRIPTION -- Unused mint condition colour postcard from the old Cunard White Star Line vessel the Mauretania which is original and is an early item from this famous vessel. HISTORY -- RMS Mauretania was launched on 28 July 1938 at the Cammell Laird yard in Birkenhead, England, and was completed in May 1939. The second Mauretania was the first ship built for the newly formed Cunard White Star company following the merger in April 1934 of the Cunard and White Star Line. On the withdrawal of the first RMS Mauretaniain 1934, to prevent a rival company using the name and to keep it available for the new liner, arrangements were made for the Red Funnel paddle steamer Queen to be renamed Mauretania in the interim. DESCRIPTION -- Dating from the late 19th century this is a fantastic find which is a square straw/wood tray made by a prisoner of war on board a prison ship. This type of item would often be found for sale in the markets of the ports where the prison ships were moored. It is in a fantastic condition and a great find and the size is 8" (20cm) square. HISTORY -- A prison ship, often more precisely termed prison hulk, is a vessel (usually unseaworthy) salvaged as a prison, often to hold convicts or with the British, often civilian internees, awaiting transportation to a Penal colony. This practice was popular with the British government in the 18th and 19th centuries. DESCRIPTION -- Unusual item has 32 in the set and are all handmade and it is a collection of mini scale (2" - 3" : 8 - 12cm wide) warships which are superb models. The ships in the collection are as listed below and some others are available in our stocks not listed on the website (click on the picture to see a close up of one of the items). DESCRIPTION -- Superb old item which has probably got a fair bit of history and is a set of wood/bone dominoes which were reputedly made by an old seaman while at sea. The set comes in a wooden box which was probably also handmade and is in a good condition. DESCRIPTION -- From the vessel The TSS Athenia this is a souvenir tea spoon which is in a great condition (click on the picture to see the company name and emblem engraved on the item). HISTORY -- The TSS Athenia was the first British ship to be sunk by Nazi Germany in World War II. Athenia was built by the Fairfield Shipbuilding and Engineering Company, Ltd., and was launched at Govan, Scotland in 1923. She was built for Anchor-Donaldson Ltd.'s route between Britain and Canada. For most of her career she sailed between either Glasgow or Liverpool, and Quebec and Montreal. During the height of winter, she operated as a cruise ship. After 1935, her owners became the Donaldson Atlantic Line Ltd. Athenia measured 13,465 gross tons, was 526.3 feet long and had a 66.4 foot beam (160.4m x 20.2m). She had two masts and a single funnel. She carried 516 cabin class passengers and an additional 1,000 in 3rd class. She was a twin propeller vessel powered by steam turbines, with a top speed of 15 knots. DESCRIPTION -- Triang model of a Floating Dock with model cruise ship which breaks down into sections and the length is 8" (22cm).